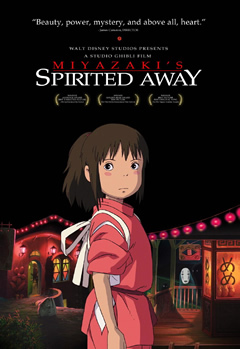 DVD Synopsis: Spirited Away is a wondrous fantasy about a young girl, Chihiro, trapped in a strange new world of spirits. When her parents undergo a mysterious transformation, she must call upon the courage she never knew she had to free herself and return her family to the outside world. Spirited Away is the only animated film I've ever seen that's perfect. It's the best of its kind. Director Hayao Miyazaki, who personally oversees every aspect of his films, is one of the few auteurs remaining in the world of animation. Each of his creations is a wonder in its own right, yet Spirited Away is his masterpiece. Every character is infused with personality and charm, and Miyazaki never allows any of them, not even his villains, to be written on a single note. Yubaba, the temperamental witch who manages the bathhouse, antagonizes Chihiro unmercifully throughout the film, yet she is not entirely evil. Yubaba is mean, yes, and very domineering, but shows that she's also capable of kindness when she praises Chihiro for the young girl's excellent work in cleaning up a particularly dirty water spirit. The fact that his characters are never pigeonholed into the normal personality traits so often associated with animated films is an important aspect of Miyazaki's unique touch, one that consistently sets him apart from his peers. A film that permeates with every shred of Miyazaki’s talent and creativity, Spirited Away succeeded in spiriting me away. I did not want this film to end. I agree. This is such a magical and imaginative film. His films never "talk down" to children like so much American animation tends to do. Instead he puts them in unique and challenging situations and shows they have the strength to find their way through. I also enjoyed Kiki's Delivery Service and Princess Mononoke. @Keith: Thanks for stopping by, and for the comment. Your point is an excellent one. Miyazaki does, indeed, show a level of respect for children that most animated films do not. His stories are rich, and his characters multi-dimensional. His is a true master of his craft. KIKI'S DELIVERY SERVICE and PRINCESS MONONOKE are also excellent films (as is his recent PONYO). KIKI'S especially: In fact, I may rank that one just behind SPIRITED AWAY. But then, I have yet to see a Miyazaki film that didn't impress me at some level. Thanks for checking out my art, Dave. Oh BTW, have you ever seen Grave of the Fireflies? Such an incredibly powerful and poignant movie. Anime at a different level of storytelling. Keith: I have seen GRAVE OF THE FIREFLIES, but it was quite a while ago. I do recall that it was incredibly moving, and I intend to watch it again during this experiment of mine. Thanks again for stopping by, and for the comment. It's appreciated. I don't think a better animated film has ever been made. It's such a beautifully crafted production in every way. Despite loving this film the very first time I saw it - I hadn't picked up on its similarities to Alice in Wonderland until I re-watched it yesterday. I haven't seen Grave of the Fireflies - i'll have to check it out after Princess Mononoke. Klaus: Agreed. It's perfect in every way (and you'll enjoy PRINCESS MONONOKE as well). with the exception of Akira. Brad: Princess Mononoke is another gem, a wonderful film! For me, though, there's no topping Spirited Away. I love the character arcs, the story, and how magical the world is. Of course, MONONOKE is no slouch in any of these areas, either...more proof that Miyazaki is a master at his craft. I agree and disagree with you, Doc. I think all of Miyazaki's films are masterpieces in their own right. This one, however, is the most accessible (and relatable). There is no denying that this is a superb tale oozing with likable characters and gorgeous animation. Miyazaki and everyone at Studio Ghibli are truly masters of their craft. It really pains me that some people can't see past the animation, because movies like these deserve to be treated as real movies and not dismissed as just another Saturday morning cartoon.